This IPA is designed for students who are studying traveling. 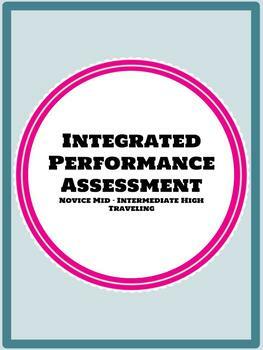 Because students are at different levels in different modes of communication, I have included the performance goals from novice mid to intermediate high. Ideally, I would use this for my Spanish II-IV students because of their study of traveling and travel plans. On Slides 4-7, there are some screenshots of the video so you can talk individually, load them up with vocabulary, have students draw one out of a hat & talk spontaneously about it. Slide 3 is a chart of the performance indicators where you/ they can establish learning goals. 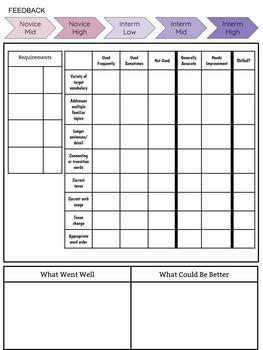 I use this as a rubric & establish grades. 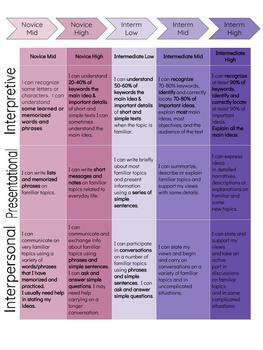 Students may not be in one indicator for each of the modes of communication. You can establish goals for each performance area. Slides 8-9 are the Interpretive Listening tasks where students will watch & listen to an authentic resource. They will answer questions about what they heard & saw. The goal of watching the video is not to have students understand every single word, but have them grasp the main ideas which is why the goal for interpretive listening for my students is intermediate mid, anything above is a bonus. Students could also watch the video with the closed captions (though it is not always correct, but it will give them a higher context). There are two different listening assessments. You can use one as practice, or you can use Listening B as a more advanced listening (there is a lot less context & students will need to rely more on Spanish knowledge). Slides 10-12 is the Interpretive Reading task where students will use the given an authentic reading to successfully answer the questions. Slide 13 is the Presentational Writing portion of the assessment where students will use what they know to write about a trip/ traveling. They will also have the opportunity to use the past tense. You can also give them a list of verbs they need to include on their assessment. Slides 14-16 contain the rubrics for the assessments. Slides 17-19 is the Presentational Speaking contain the prompts. Slides 20-21 provide students with the opportunity to practice with another interpretive reading before completing the assessment. This will allow students to gain some confidence & ask questions before the real tasks is administered. This reading, to me, is a lot more advanced, so this will allow for more questions & input from the teacher. Slide 22- Partial key for the first listening assessment.